We are focusing on a new collaborator, the Trumpeter Swan Society, and the important work they do. The main objective of the Society is to provide understanding of the species and to help the birds to enjoy a healthy existence. This means that until the populations of the swans are restored across North America to the levels they once were, there is a lot to do. The Society formed in 1968 and has a list of accomplishments. And, while trying to protect the species, there is an urgent issue that has surfaced over the past several years: lead poisoning. Currently, scientists are working very hard to figure out from where this problem is coming! Two of the Trumpeter Swans we are tracking this season have apparently died from lead poisoning. Ruth Shea, the Executive Directory of the Trumpeter Swan Society reports, “If the birds tracked in Signals of Spring were healthy enough to move, they would have headed toward the rivers along the U.S. and Canadian border to feed. This staging, where the birds feed, takes place before a likely long trek to West Central British Columbia.” Two of the animals Signals of Spring is tracking appear, however, to be making the trip to the breeding grounds, as they are feeding now along rivers. The 2005 animals are: Zion and Ticker. The problem is lead, and the poisonous nature of the material. Somewhere, the birds are feeding in contaminated areas, and nearly 2000 birds have died since early 2004. This is possibly occurring on their wintering grounds, and comes from old toxic ammunition used by hunters. Somewhere the lead has accumulated. The lead shot pellets were banned in 1991. This is why it is so important to be able to gather many good observations. Next, as is appropriate in all areas of science, we perform further research and analysis to figure out answers the problem. In addition to satellite transmitters that are used to help scientists to learn the locations of the animals, VHF “radio” transmitters are used. This way, even small movements in birds, for instance, can be determined, and the animals can be closely monitored to try to find out from exactly where the source of the lead is coming. 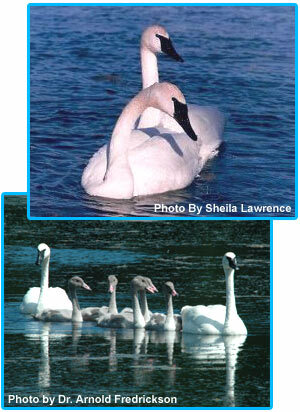 Check back with the Trumpeter Swan Society on the progress of this critical environmental issue.